The 2017 Hyundai Azera in Arlington is a well-equipped model for its class. Packed with a variety of technology features and amenities, the car aims to provide a premium in-car experience for all passengers. While riding in the Azera, which seats up to five passengers, you'll notice the model delivers a smooth ride and is extremely quiet. 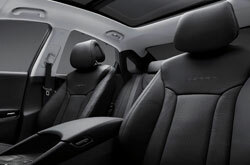 The large interior also makes it incredibly roomy for all occupants. 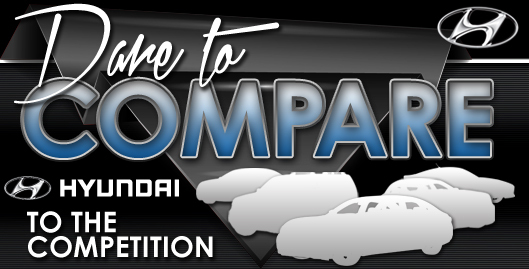 Want to learn more about the sedan? Browse our 2017 Hyundai Azera review below. 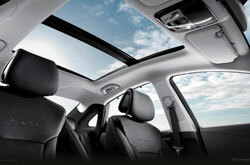 Base and Limited are the only two models the Azera is offered in. Each version of the car comes with a series of great features, including Bluetooth, navigation, a 14-speaker sound system, and Apple CarPlay and Android Auto integration. The base trim is standard with 18-inch wheels, keyless entry, heated mirrors, dual-zone automatic climate control, power front seats, leather seating, heated front and rear seats, a chilled glovebox, a hands-free automatic-opening trunk and an auto-dimming rearview mirror. The Limited adds on 19-inch alloy wheels, automatic high-beam control, xenon headlights, a panoramic sunroof, rear parking sensors, manual side-window shades and a power rear sunshade. The 2017 Hyundai Azera in Arlington is offered solely with a 3.3L V6 engine, delivering 293 horsepower and 255 lb.-ft. of torque. A six-speed automatic transmission backs up the powerplant and sends power to all four wheels. The base version of the Azera provides an EPA-estimated 23 mpg combined, 20 city and 28 highway with this setup. 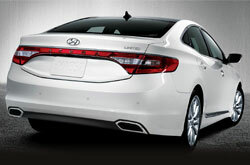 Noted in select 2017 Hyundai Azera reviews, blind spot monitoring and lane departure warning can be found on the Limited trim. Across the lineup, you can also find antilock brakes, airbags, a tire pressure monitoring system, emergency brake assist, traction control, stability control, child seat anchors, a remote anti-theft alarm system and rear door child safety locks. 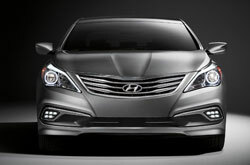 Want More Specs on the Hyundai Azera? Find out why people in the market for new vehicle models near Dallas consider the venerated 2017 Hyundai Azera over the 2017 Toyota Avalon, Buick Lacrosse, Ford Taurus and the Chrysler 300. Offering a driver-focused personality and innovative features, it could be just what you need from a vehicle. Now that you're almost finished with our 2017 Hyundai Azera review page, make sure to check out exclusive incentives offered at Vandergriff Hyundai! When you visit our Hyundai dealership, you'll find factory incentives on a broad range of new and pre-owned cars, including offers for the sought-after Hyundai Azera. When picking out a car, it's imperative to make a knowledgeable choice; that's why we've included this 2017 Hyundai Azera review perfectly built on our site. 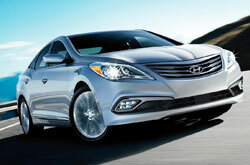 We have various Hyundai Azera models for sale in Arlington, TX; at Vandergriff Hyundai and stop by to be pleased with a test drive - sending a request for an appointment ahead of time is easy. Before you visit, you can take a glance at its trendy interior features by watching the embedded video clip.